Jean lives in Canada with her husband and two kids. She can often be found outdoors hiking up mountains, playing on the soccer field, racing her dog on her bicycle--sometimes the dog lets her win--or inside writing her next novel. Subscribe to Jean's newsletter and get a taste of her small town comedies that will have you laughing while falling in love. Get your FREE ebook by signing up here: www.JeanOram.com/FREEBOOK. A Pinch of Commitment is a wonderful, sweet romance. Ethan and Lily will grab your heartstrings and pull. Hard. They are a dynamite couple who have a firm foundation for their love to blossom, grow, and withstand the storms of life. They deserve an HEA after what they have each endured. Ethan was introduced in The Surprise Wedding as Devon's brother. If you loved Devon, you will love Ethan. They share the same core values and when they love, it is with their entire being. If you haven't read Devon's story, what are you waiting for? It is an awesome 5 star story. If you like stories that are well-written, with characters that are everyday people, and a top-notch story, look no further. A Pinch of Commitment is the book for you. Actually, all of Jean's books are awesome and I recommend reading everything this talented author writes. Jean Oram books that I have read so far, have has always been excellent. She is an awesome story teller. This particular book is about Lily and Ethan..... their ups and down, but the love they had for each other eventually brought them together for their happy ever after. 5.0 out of 5 starsLearning To Trust Again. Ethan fiancé returned his ring when he’s paralyzed after an avalanche. Lily is betrayed by three different men before retuning to Blueberry Springs. 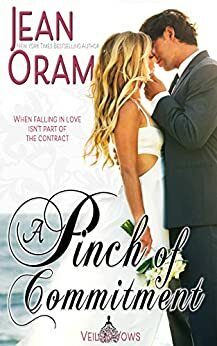 Will their contract marriage lead to trust and love and healing or just more pain? Recommend. 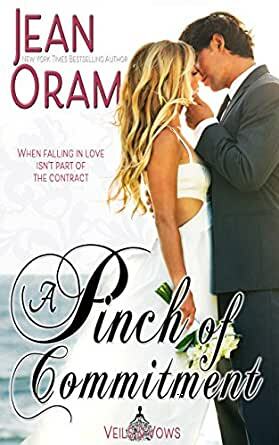 "A Pinch of Commitment" (Veils and Vows Book 2) by Jean Oram is a great read. I loved Lily and Ethan's story. This story has twists and turns, romance, humor, family, and more. It's alway fun to visit the interesting and entertaining characters in Blueberry Springs! Highly recommend to all fans of romance. I do not do book reviews, but glad I have Amazon to keep my Kindle full of good reads. (have to admit some only last 5 pages but I have many good ones to take the place of my bad choices.